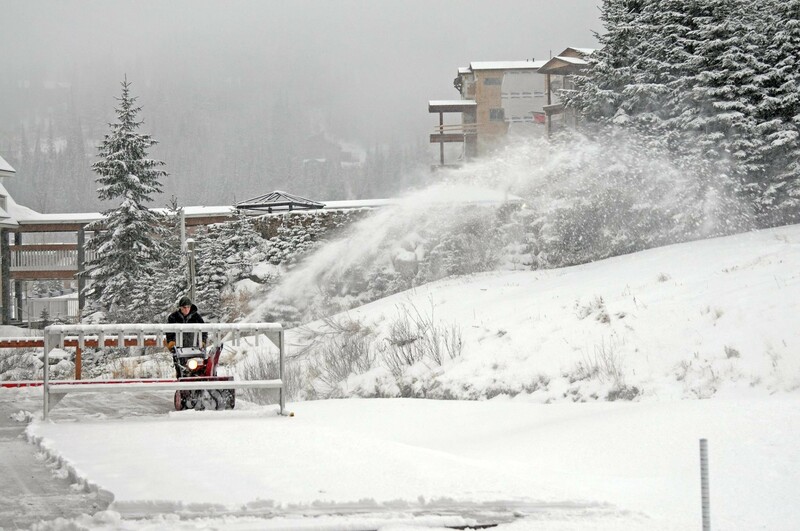 The scene earlier today at the North Idaho resort. You might have noticed that unusual white discharge plummeting from the sky when you woke up this morning. That's snow, and it's been a while since we've seen any around here. While some Inland Northwesterners are already driving like they've never seen the stuff as they navigate the roads, many are rejoicing at its arrival, none more than the local ski resorts that struggled through a momentously awful ski season last year. Schweitzer Mountain Resort sent word that they'll officially open on Friday, and they've been updating their Facebook page as they get more inches on the ground. The North Idaho mountain started manufacturing snow early this month, so they were glad to see the real stuff fly. Bill Williamson, the mountain's operations director, noted Monday that "we have received about 12 inches of natural snowfall, and with the cold temps last week, we were able to keep our snow machines turning, giving us another foot or so." Add the overnight dump, and there should be some worthy turns to look forward to this weekend. Schweitzer plans to have the Basic Express Quad running Friday through Sunday from 9 am to 3:30 pm, and adult full-day tickets are $40. The mountain will close after the weekend, but reopen the next Friday, Dec. 4. For more info, visit the resort's website.